Description This chapter describes the dermoscopyThe examination of [skin lesions] with a 'dermatoscope'. This traditionally consists of a magnifier (typically x10), a non-polarised light source, a transparent plate and a liquid medium between the instrument and the skin, and allows inspection of skin lesions unobstructed by skin surface reflections. Modern dermatoscopes dispense with the use of liquid medium and instead use polarised light to cancel out skin surface reflections. signs of cicatricial alopeciaThis glossary term has not yet been described. Discoid lupus erythematosus (scalp) N.N. Trichoscopy, Cicatricial alopecia Primary cicatricial alopecia – cite! Primary cicatricial alopecia (message) Primary cicatricial alopecia – participate! Lichen planopilarisThis glossary term has not yet been described. The most common trichoscopic features of classic lichen planopilarisThis glossary term has not yet been described. include the absence of follicular openings, perifollicular scaling and white cicatricial areas. Other common trichoscopic findings are perifollicular erythema, milky-red areas, classic white and blue-grey dots (1, 2) (3). In frontal fibrosing alopecia, perifollicular scaling, the absence of follicular openings, perifollicular erythema, white cicatricial areas, blue-grey and classic white dots are most commonly observed (1, 2). Milky-red areas are not observed in trichoscopic examination (2). Perifollicular scaling and perifollicular erythema are considered as markers of disease activity. Perifollicular erythema and white cicatricial areas are associated with disease severity (1). Template:Trichoscopy of lichen planopilaris with presence of perifollicular, white scaling and milky-red areas with absence of follicular openings. Discoid lupus erythematosusis a chronic skin condition of sores with inflammation and scarring favouring the face, ears, and scalp and at times on other body areas. These lesions develop as a red, inflamed patch with a scaling and crusty appearance. The centre areas may appear lighter in colour with a rim darker than the normal skin. Characteristic trichoscopic findings of discoid lupus erythematosusis a chronic skin condition of sores with inflammation and scarring favouring the face, ears, and scalp and at times on other body areas. These lesions develop as a red, inflamed patch with a scaling and crusty appearance. The centre areas may appear lighter in colour with a rim darker than the normal skin. include large yellow dotsDots are small, round structures of less than 0.1 mm in diameter that have a red color when corresponding to blood vessels; however, when due to melanin, their color ranges from black, brown, to blue-gray depending on the depth and concentration of the melanin in the skin (Tyndall effect)., red dots and large yellow dots with radial, thin arborizing vesselsanalytic term is branched vessels; Bright red sharply in focus large or thick diameter vessels dividing into smaller vessels; BCC emerging from the dotSee [[Glossary:Dots|Dots]] (also known as “red spider in yellow dot”). Other typical trichoscopic features of the disease are thick arborizing vessels, scattered dark-brown discoloration and blue-grey dots arranged in a “speckled” pattern (2). 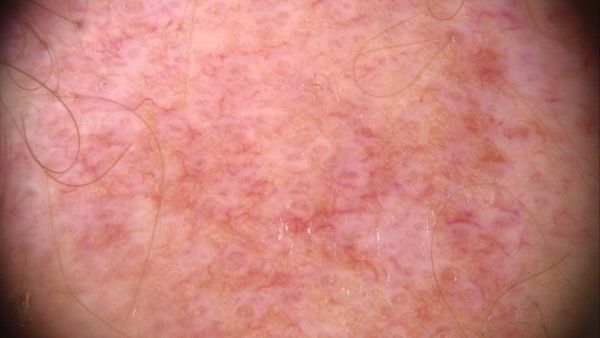 The active (early) discoid lupus erythematosus is characterized by presence of thick arborizing vessels, large yellow dots, fine interfollicular scaling, red and blue-grey dots and brown discoloration (4, 5) (3).In inactive (end-stage) lesions mainly white and milky-red areas with lack of follicular openings, arborizing vessels and yellow dots containing thin spider vesselsThis glossary term has not yet been described. are observed (4). Template:Trichoscopy of discoid lupus erythematosus with presence of yellow dots, red dots and arborizing vessels. Template:Large yellow dots with patient with discoid lupus erythematosus. 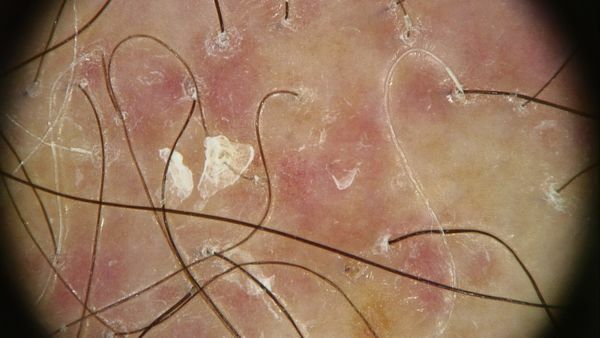 Tufted hairs (multiple hairs emerging from a single dilated follicular opening) are the most common and characteristic trichoscopic finding of folliculitis decalvans (2) (6). Other trichoscopic features include perifollicular hyperplasia arranged in a starburst patternThis pattern consists of peripheral globules, pseudopods or streaks (or a combination of them), located around the entire perimeter of the lesion, yellowish tubular scaling (with a collar-like widening at the distal end), crusting, and follicular pustules (7). In the late, inactive disease white and milky-red areas with lack of follicular openings are observed (4). 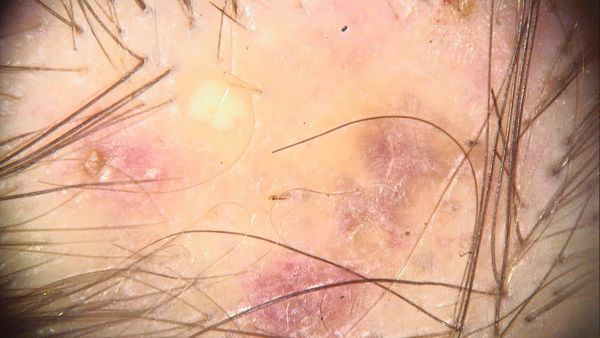 Template:Tufted hairs, scaling and crusting in patient with folliculitis decalvans. The most characteristic trichoscopic findings of dissecting cellulitis are yellow, structureless areas and yellow dots with "3D" structure imposed over dystrophic hair shafts (2). Moreover black dots, yellow dots perifollicular pustules and pinpoint-like vessels with whitish halo may be also detected (2, 8). 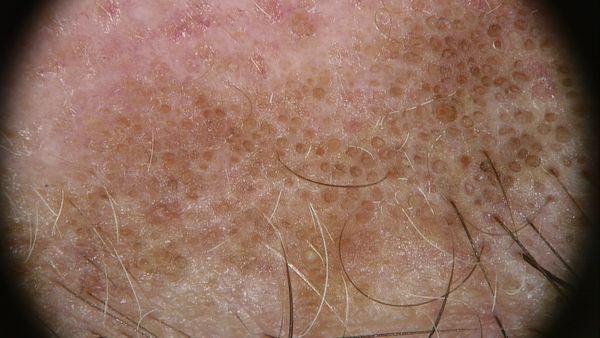 In active lesions, mainly empty follicular openings, yellow dots and black dots are observed. Long-lasting, nonactive dissecting cellulitis is characterized by presence of yellowish/whitish areas with absence of follicular openings (8). Template:Trichoscopy of dissecting cellulitis with presence of yellow, structureless areas and perifollicular pustule. 1. Waśkiel A, Rakowska A, Sikora M, et al. Obraz trichoskopowy liszaja płaskiego mieszkowego. Przegląd Dermatologiczny/Dermatology Review. 2018;105(1):63-75. 2. Rakowska A, Slowinska M, Kowalska-Oledzka E, et al. TrichoscopyThis glossary term has not yet been described. of cicatricial alopecia. J Drugs Dermatol. 2012;11(6):753-758. 3. Duque-Estrada B, Tamler C, Sodre CT, et al. DermoscopyThe examination of [skin lesions] with a 'dermatoscope'. This traditionally consists of a magnifier (typically x10), a non-polarised light source, a transparent plate and a liquid medium between the instrument and the skin, and allows inspection of skin lesions unobstructed by skin surface reflections. Modern dermatoscopes dispense with the use of liquid medium and instead use polarised light to cancel out skin surface reflections. patternsThis glossary term has not yet been described. of cicatricial alopecia resulting from discoid lupus erythematosus and lichen planopilaris. An Bras Dermatol. 2010;85(2):179-183. 4. Rudnicka L, Olszewska M, Rakowska A. Atlas of trichoscopyThis glossary term has not yet been described. 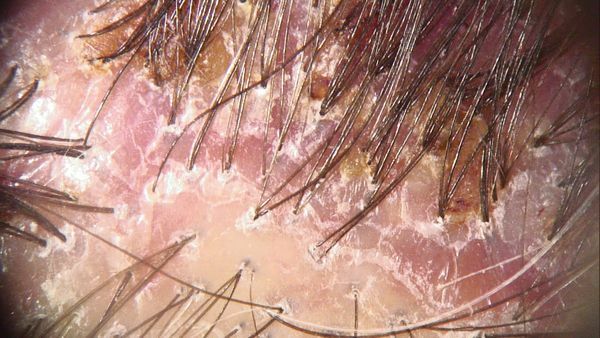 : dermoscopy in hair and scalpThis glossary term has not yet been described. disease. London: Springer; 2012. 5. Tosti A, Torres F, Misciali C, et al. Follicular red dots: a novel dermoscopic pattern observed in scalp discoid lupus erythematosus. Arch Dermatol. 2009;145(12):1406-1409. 6. Fernandez-Crehuet P, Vano-Galvan S, Molina-Ruiz AM, et al. Trichoscopic Features of Folliculitis Decalvans: Results in 58 Patients. Int J Trichology. 2017;9(3):140-141. 7. Rudnicka L, Olszewska M, Rakowska A, et al. Trichoscopy update 2011. J Dermatol Case Rep. 2011;5(4):82-88. 8. Verzi AE, Lacarrubba F, Micali G. Heterogeneity of trichoscopy findings in dissecting cellulitis of the scalp: correlation with disease activity and duration. Br J Dermatol. 2017;177(6):e331-e332. This page was last modified on 29 March 2019, at 14:04.